(CNN) -- As you encounter flights that leave you frustrated, hungry and tired this summer vacation season, chances are the person who greets you with a smile when you come on board could be feeling the same way. 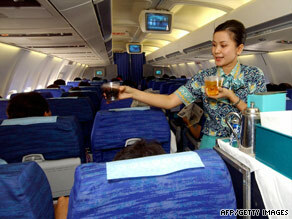 A flight attendant serves beverages to passengers. A duty day can last up to 14 hours on domestic routes. The glamour has long faded from the job of a flight attendant, but the occupation still captures the imagination of a public fascinated by the constant travel and work above the clouds. Still, many people know little about the realities of a flight attendant's life, changed by the September 11, 2001, terrorist attacks, the efforts of a troubled airline industry to stay afloat and the recent economic downturn. "When my mom was a stewardess in the 1950s, they wore white gloves and they learned to serve lobster thermidor table-side," said Rene Foss, a flight attendant for 25 years and the spokeswoman for the Association of Flight Attendants. "Instead of wearing white gloves, I'm wearing rubber gloves; and instead of learning to serve lobster thermidor, I'm learning to put handcuffs on passengers." Meanwhile, pay cuts are forcing many to work more hours to offset the difference. "I made more money in 1998 than I make today," said Kim Kaswinkel, a flight attendant for 22 years who holds a legislative committee chair position at the Association of Flight Attendants. The days can be long -- up to 14 hours of duty time on domestic routes and even longer on international trips -- and the layovers short, sometimes shorter than the workdays. Flight attendants say they often battle hunger as airlines eliminate meals for passengers on shorter flights, which also means fewer food options for them. "There are days, specifically domestically, you go 7, 8, 9 hours and have not gotten anything to eat because there's no food on the airplane; and when they're trying to turn these airplanes around quickly, there's no time to run off and get food," Kaswinkel said. She carries protein bars and apples with her to help fend off hunger. Flight attendants fly 70 to 100 hours a month, but they're only paid when a plane's engines are running, Foss said. So they receive no compensation for one of the hardest parts of their job: the boarding process. It's now more aggravating than ever as passengers bring more carry-on bags to avoid paying fees for checked luggage, sometimes resulting in confrontations and delays when there is no space to accommodate them. Kaswinkel called the carry-on situation "out of control." Frustrated passengers often take it out on the crew and sometimes each other. As she tries to enforce rules and resolve conflicts, Foss said she sometimes feels like a police officer, a baby sitter and a referee. Flight attendants say they try to create a friendly atmosphere, but sometimes get little response. "A lot of passengers complain that flight attendants don't smile, but I can't tell you how many times I've stood at the boarding door with a smile on my face greeting people and they will just ignore me," said Heather Poole, a flight attendant for 14 years who writes for the travel Web site Gadling.com. Seniority determines many aspects of a flight attendant's life, including what routes they fly and whether they work in economy, business or first class. Surprisingly, some flight attendants consider economy easier even though they serve many more passengers. Coach usually requires only a drink service, while flight attendants in the other cabins work almost nonstop serving meals and drinks. Shoes wear out quickly at this pace. Poole, who mostly works in business class, says she buys a new pair every three months. A particular problem is "cart toe," leather that wears out on the nose of the shoe where she pushes the brakes on the carts that hold drinks and meals. There are many tales of strange passengers. Foss recalled waiting on the tarmac to take off from Tokyo, Japan, when a woman suddenly took off all her clothes and began running up and down the aisles. The plane had to return to the gate, where police were waiting to remove her. Kaswinkel is amazed that people still try to smoke on planes and recalled a recent incident in which a passenger offered her $5 to not write her a warning after she caught her sneaking a cigarette in the lavatory. Poole still remembers the passenger who removed a fire extinguisher from the plane to take as a souvenir. With all the travel they do, you might wonder how flight attendants choose to spend their vacations. Some continue to fly even in their free time, while others cherish "staycations" or find ways to globe-trot without getting on a plane. Poole was a frequent traveler until she got married and had a child. Now that her son is 3, she's ready to start jetting off with him on vacation. Foss considers it a joy to sleep in the same bed for a few nights, but also likes train travel. Kaswinkel's ideal vacation after being away from home for 16 to 18 days a month is also staying put. But that's not fun for her family, so she does travel occasionally during her time off. "We enjoy cruising the most because I can relax and do nothing by the pool with a frozen drink, while they go tour the destination ports of call. It's a great compromise," Kaswinkel said.